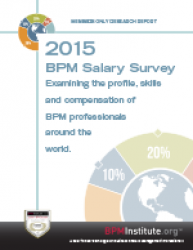 The 2015 BPM salary survey of BPM Professionals represents the first such survey by BPMInstitute.org and as such will form the baseline for future research in this area. The objective was to examine the profile, skills, and compensation of BPM professionals around the world. This research examines factors such as age, gender, education, job satisfaction, salary and bonus, certification, background, and other characteristics. Respondents from USA, Canada, Europe, Asia, Middle East and Mexico provide a truly global flavor to the survey. On an international basis, nearly 70% of respondents were male and 30% were female and 57% of respondents were between the ages of 26 and 45. 61% of respondents were employed in organizations with annual revenues greater than $50 million per annum. the impact BPM certificates and certification have on average salaries.